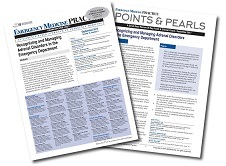 Primary and secondary adrenal insufficiency are underrecognized conditions among emergency department patients, affecting an estimated 10% to 20% of critically ill patients. The signs and symptoms of cortisol deficit can be nonspecific and wide-ranging, and identification and swift treatment with stress-dosing of hydrocortisone is vital to avoid life-threatening adrenal crisis. Laboratory evaluation focuses on identification of electrolyte abnormalities typical of adrenal insufficiency, and while additional testing may depend on the type and severity of symptoms, it should not delay corticosteroid replacement. 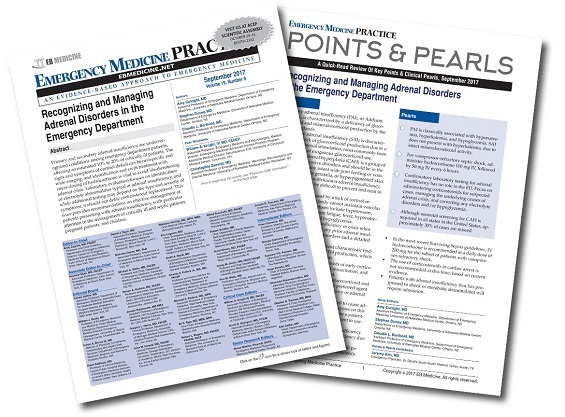 This issue provides recommendations on effective management of patients presenting with adrenal insufficiency, with particular attention to the management of critically ill and septic patients, pregnant patients, and children. A 24-year-old woman presents with complaint of nausea with vomiting and diarrhea for 3 days. She has not been able to keep anything down, including any of her medications, for the last 36 hours. A review of her chart reveals that she has primary adrenal insufficiency. Her triage vital signs include mild hypotension of 81/48 mm Hg and tachycardia, at 120 beats/min. Two liters of IV normal saline (0.9% sodium chloride) are ordered, and antiemetics are administered. Her tachycardia begins to improve, but her blood pressure remains low, with systolic blood pressure in the low 80s. You wonder: What is the best way to replace steroids, and is there any indication for obtaining cortisol levels or ACTH stimulation testing?